Betsy and I got back over the weekend from a few weeks in Peru. It was a pretty awesome trip, the highlight was which was hiking the Incan trail to Machu Picchu for four days and three nights. It was a great adventure and trip so I thought I’d share some photos from our journey! 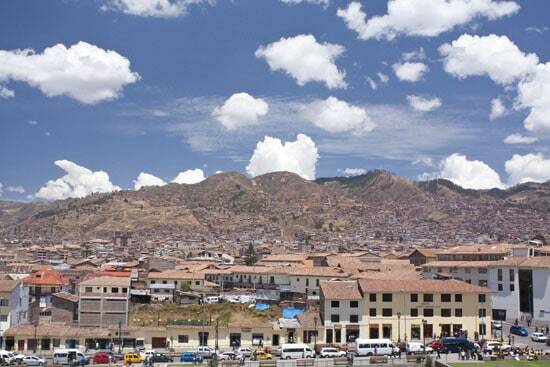 If you ever want to go to Machu Picchu, you have to first stop at Cusco, a town of about 400,000 people that sits high in the Andean mountains. We had great weather and blue skies when we got there. We hit up a few museums and markets in Cusco, but mainly we just prepared for our hike which started three days after we got to Cusco. They recommend getting there a few days early so you can adjust to the altitude. 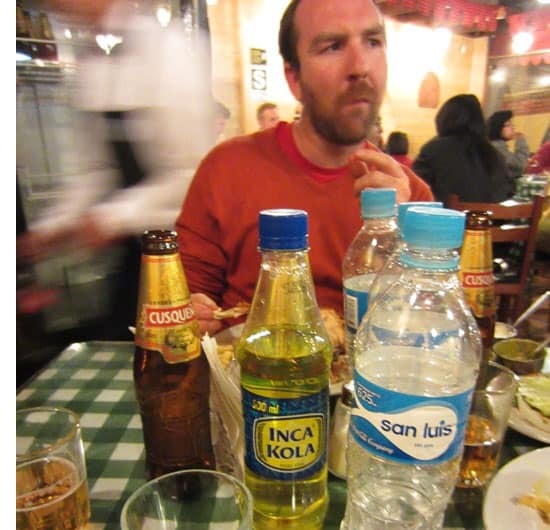 We ate pretty well and I tried out the famous Inca Cola which is a Peruvian local favorite. It basically tastes like liquified bubble gum. I was not a fan. 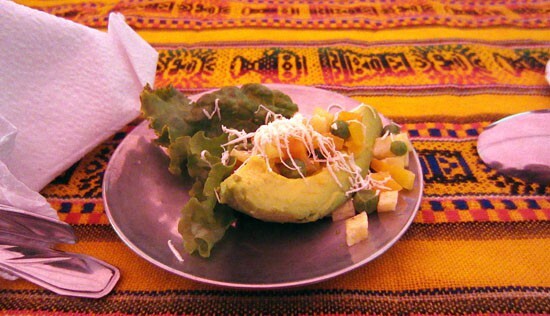 We ate well in Cusco, but I didn’t take a ton of photos in restaurants. I really don’t like to do that. Let’s get onto the important stuff! We started our trek in a group of 14 people from various places. Betsy and I went with two good friends so we were 4 of the 14. 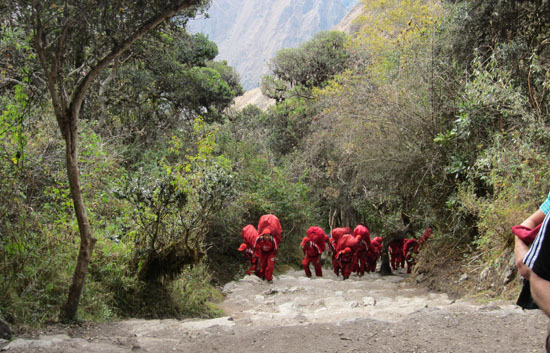 We also had a 21 person support team of Peruvian porters, cooks, and guides. So our total group was a whopping 35 people. I was a bit concerned that this would be annoying, but it didn’t really matter. People spread out on the trail and there are a bunch of other groups. 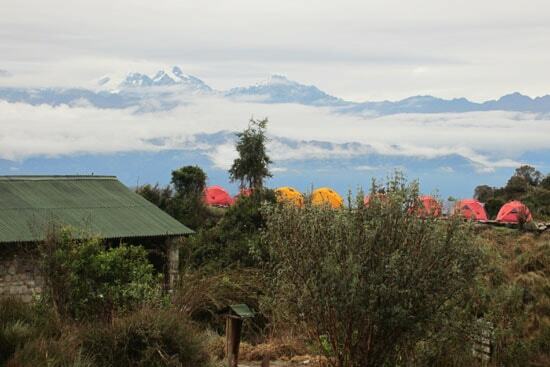 Even if you hired a private guide and porters, you’ll still be around other people at campsites and stuff. We picked up a bus at around 5AM the day of the hike and were on the trail by noon after a few hours of delay for passport issues. Once we hiked for a few hours, we found our first ruins! First ruins on the trail. The trail is generally pretty hard and our group of four was the only four out of our 14 that chose to carry our own gear. In hindsight, I wouldn’t advise that people do this. It was really hard and my friend Sean actually twisted his knee one day on the trail which made it even more difficult. 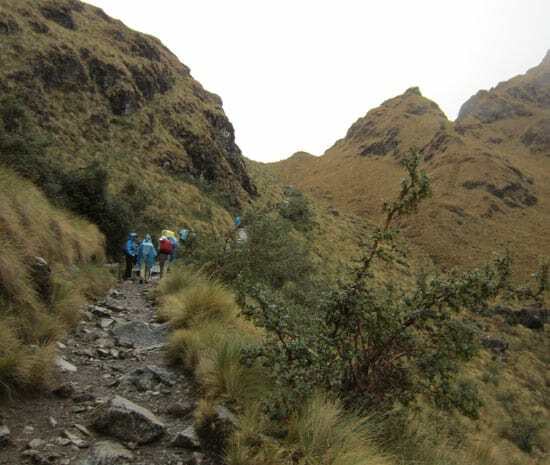 The motto we decided on for this hike is: “Don’t be a hero.” The Peruvians are great at guiding people through the trail so just let them do their thing. This was one of the steepest parts of the trail which was at the beginning of day two for us. We had to summit this pass that was almost 14,000 feet and we started the day by basically going straight up 3,000 feet. Oh… and it was raining. New definition of up hill. Day two was the hardest day of hiking for most people. For me though, the third day was the hardest because it was basically all downhill. 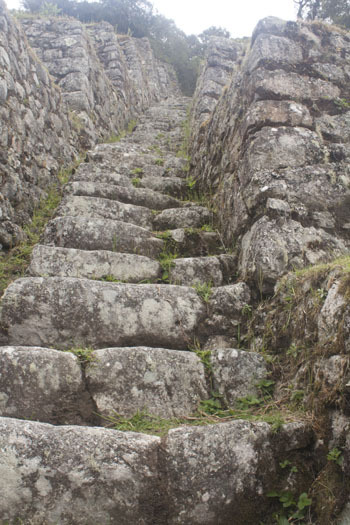 Our guide estimated that it was about 3,000 Incan stone steps down. My knees did not love that day. It was misty and cool looking though on this day as we hiked through ancient ruins. At the end of day two, we camped at the top of one of the ranges and this was the view we found when we woke up. 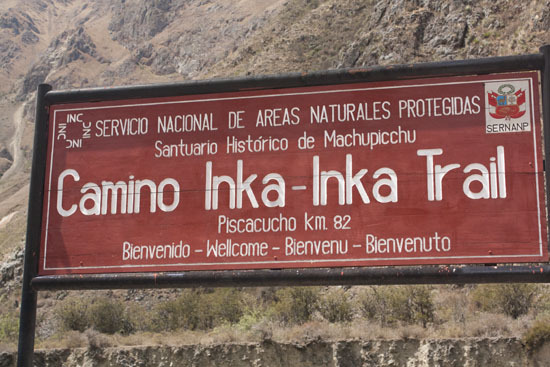 After a while, you almost get numb to the crazy Incan ruins that you hike through on this trail. The trail just winds in and around them. The Peruvian government made it impossible to do this trail on your own which is probably a good thing. I can imagine stupid people like myself that would try and fail at it and then have to be life-flighted out of the Andean mountains. While the ruins are all amazing, I was even more impressed by our porters and guides. They basically carried all of our gear and food for four days and were in good spirits to boot! I especially liked our team from Llama Path because they all wore bright red and stayed together on the trail. Every day, after our group left, they would pack up camp, then pass us on the trail so they could have the next camp setup by the time we got there. They were known as the red army for obvious reasons. To be honest, I didn’t know what to expect on the trail when it came to food. I expected lots of beans and rice and hearty dishes. On our first lunch, this was one of three delicious courses we were served. This was not your normal camp food. First lunch on the trail. Here’s a smattering of other food shots I took throughout the trail. We were fed a lot everyday (we needed it) and we were fed well. Yes… our cooks actually baked a cake somehow on the hike. I’m still unclear how they did this. On the last day, we started our hiking at a bright and early 3:30AM. What they don’t tell you in the brochure is that you have to get up this early to wait for two hours at the entry point to Machu Picchu. Everyone has to do this if you hike the trail. It’s annoying, but people are in good spirits and if you’re lucky you’ll get a good sunrise out of it. 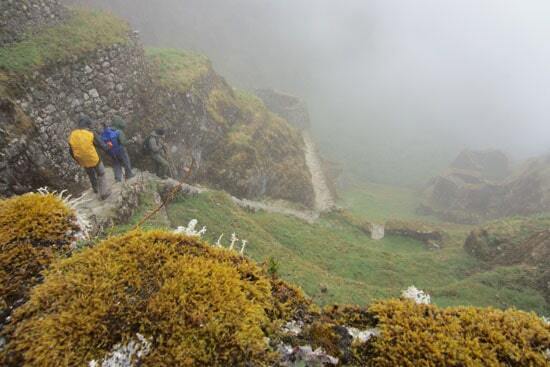 The hike to Machu Picchu is short on the last day. Just about 90 minutes and one very steep staircase up to the sun gate. No photo I’ve seen of this view really does it justice. It’s really an amazing site to see and one that I’ll never forget. 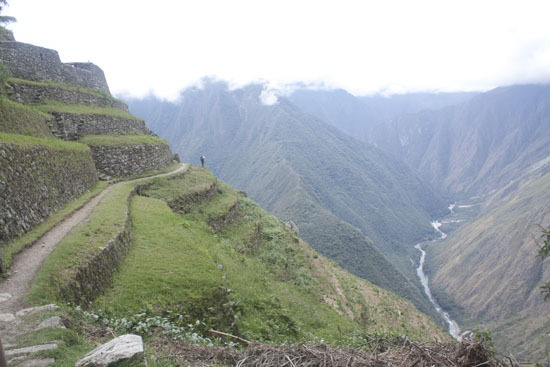 That said, to be honest, the hike for me was cooler than Machu Picchu itself. Something about the journey is better than the destination… blahblahblah. Machu Picchu was definitely cool though and even though we were all very tired, we had plenty of time to wander around. One of the most fascinating parts of the whole place to me was investigating the stone work. These people built huge cities on the mountain side out of granite rock without any sort of modern tools at all. They didn’t even use mortar in their walls. 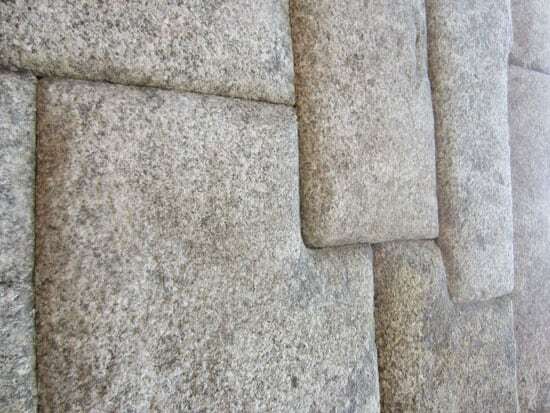 The stone work is so perfect that you can’t even fit your fingernail between two stones. It’s flawless work which is one reason why it has lasted so long. 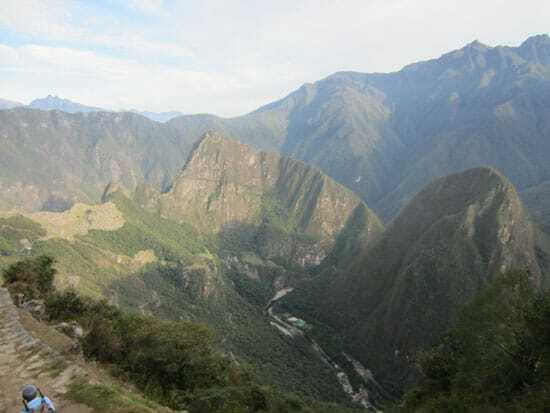 Once we parted ways with our hiking friends, Betsy and I went down into the Sacred Valley and stayed for a few nights at a bed and breakfast that Betsy had found. It turned out to be one of my favorite parts of the trip. The bed and breakfast was called The Green House and is run by these two fantastic guys who are amazing cooks and wonderful hosts. 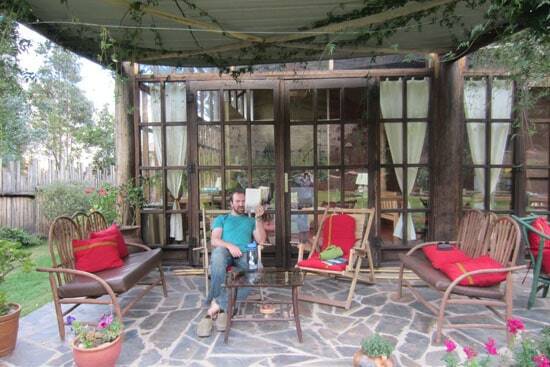 It also happened to be recently voted the best bed and breakfast in all of South America on Trip Advisor. I haven’t been to every bed and breakfast in South America, but this one was really top notch. We didn’t do much while we were there. We just read and ate well and relaxed. 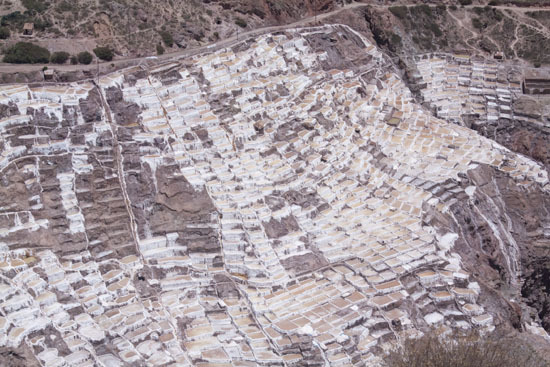 One day we did venture out though to go to the Salinas Salt mines which were reasonably close. I thought these were the weirdest things. They have been used for hundreds of years to filter salt into pools which evaporates. The interesting factoid about these is that it isn’t one company that owns the mines. Each pool is actually individually owned and operated. So you can buy a little pool and then mine and sell the salt. 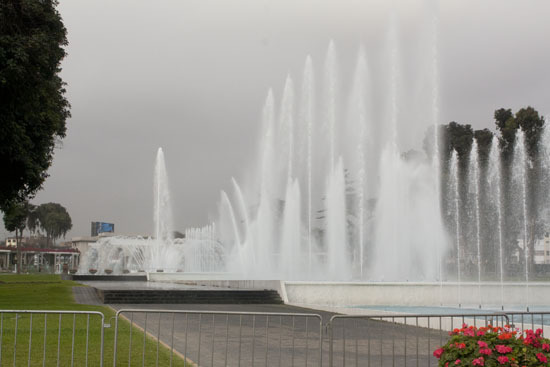 Before we flew out, we also spend a few days in Lima which turned out to be our least favorite part of the trip. Lima is a loud and kind of dirty city and I think we were just tired after hiking and everything. We did find this cool park of fountains though that reminded me of Vegas. 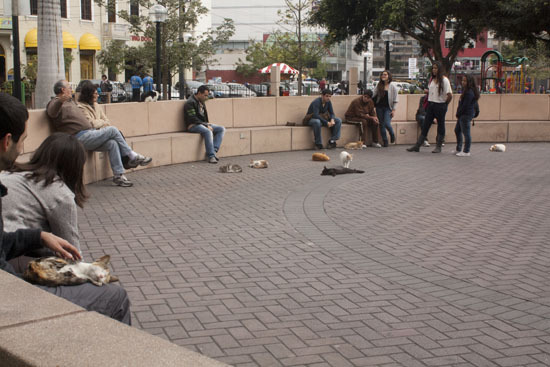 Quite honestly, one of our favorite parts of Lima was hanging out in the main park in Mira Flores which we started calling Cat Park. There are just dozens of affectionate cats chilling in the park. I think they are actually somehow taken care of by the city because most of them were marked. They seemed to be all well-fed and in good health. Ok… like I said. I’m not great at taking photos of food, but I did snap a few pics of some of the markets we visited throughout the weeks. In Cusco, wheelbarrows are big business. You can buy almost anything out of a wheelbarrow. 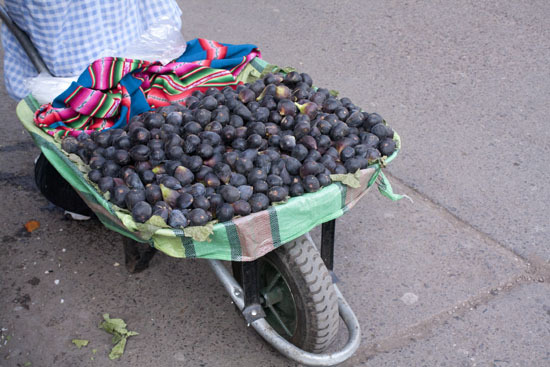 Fresh figs? Why not. I tried one and did not get Montezuma’s Revenge. 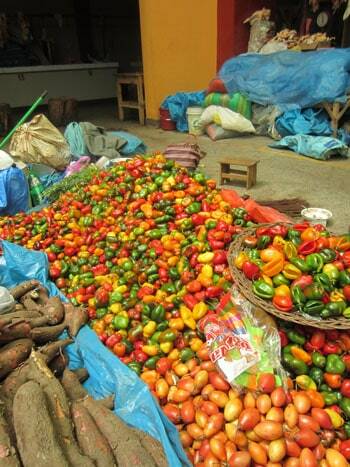 Peru is known for lots of different foods, but potatoes probably are their main crop. They have thousands of different kinds of potatoes. 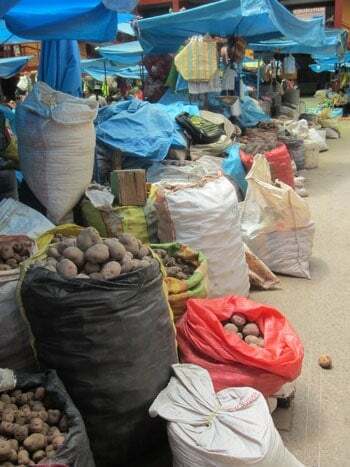 When you go to a market, it’s just rows and rows of potatoes. And peppers! Lots of peppers. 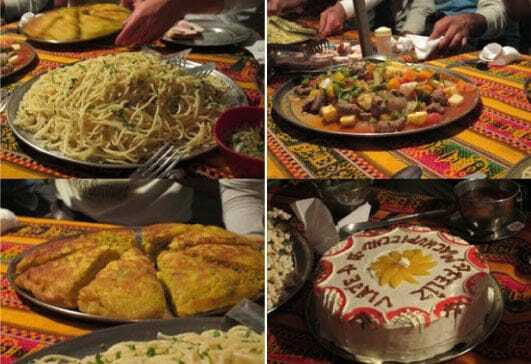 We ate a variety of different things and tried our best to sample all the local cuisines. The only thing we didn’t have a good opportunity to try was cuy (guinea pig). I wasn’t opposed to trying it, but just didn’t get the chance. We did try alpaca though (delicious) and lots of ceviche in Lima. While I didn’t take a lot of photos of what we ate, I did take lots of notes so expect some fun Peruvian dishes coming your way in the next few weeks! Your pics make me want to do the same thing. I’m an avid hiker and enjoy trekking up to experience fantastic views. Totally worth the pain. :) Looking forward to your Peruvian-inspired recipes! What an amazing experience! Looking forward to your recipes. Ahhhh Peru! Birthplace of the potato. When there, I tried every kind of potato I could find and didn’t have a bad dish once. I also tried cuy. The closest I could come to taste would be quail I think…but a little oilier. I was going to cook some here for some friends but found the cheapest I could find was $24 each at a pet store. Needless to say, I didn’t cook cuy. lol I did Chile, Peru, Ecuador and loved them all but really would like to go back and spend a couple of months in Chile….amazing place, amazing people and the fish and seafood were A M A Z I N G!!!!! Glad you had a great time and I look forward to your recipes. Very cool trip. The one shot (3000 steps down) made my knees weak, as I have an ungodly fear of heights. When your friend tweaked his knee, I picture you mocking him, “Awwww you spwained your iddy biddy knee? I had SURGERY on mine, man up!” Kidding of course. How did your knee hold up by the end of the trip, all good? Yep! My knee held up just fine. It was pretty stiff after each day, but no major issues! Thanks for asking! Beautiful pics! Glad you and Betsy had some time to enjoy nature and each other. Thanks for sharing!! This reminds me of Michael Palin’s trip to the Himalayas–another superb trip that made me add the Khyber Pass to my bucket list. Looks like an incredible trip! Looking forward to lots of Peru-inspired recipes! I had the pleasure to meet you and Betsy on this trip and to cook for you!!!!. Now…I am a big fan of your website and I hope we can see each other again very soon! I love the pics and thank you for the wonderful comments on our place! Big hug! Where did you stay in Cuzco? I’m planning a trip there now and would love a suggestion! Yea… keep in mind we were looking for cheap and really just slept there but we just stayed at the Kokopelli hostel which we found to be clean and friendly. Definitely on the younger end of things (we were like the oldest people there ha!) but it was inviting and fine and had a lively bar. (http://www.tripadvisor.com/Hotel_Review-g294314-d3258704-Reviews-Kokopelli_Hostel-Cusco_Cusco_Region.html) I would recommend paying a few extra soles for a private room though if you can. ;) Have fun. It’s a great trip! Good information, very useful post. Thanks for sharing this. I definitely learned something valuable.Must bookmark this blog so that I could come back for more future readings. Peru has amazing foods, i like too much the ceviche. 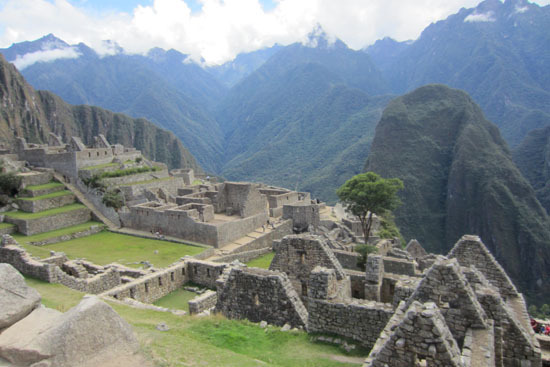 Machu Picchu is one of the most amazing places in the world, so it is considered one of the 7 Wonders. 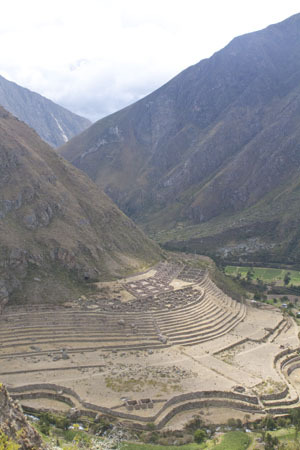 some say they lost city of the Incas, but you must visit this amazing Inca citadel to see its majesty. Peru is a surprising country in all aspects. Besides having an amazing history, it prides itself on having an impressive gastronomy, varied and full of color and flavors. And if this were not enough, its division into the coast, sierra and jungle offers a cultural variety that makes it a country full of nuances and charms that always surprise and fall in love. Great Post and Nice Article. All of the Photos are so good. I like it.Thanks for sharing.